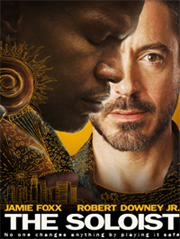 The star power of Jamie Foxx and Robert Downey Jr. in The Soloist is shining a spotlight on the challenges faced by people experiencing chronic homelessness. Like Nathaniel Ayers Jr. in the film, those considered chronically homeless (using the Federal definition) have a major disability that keeps them on the street or in and out of shelters – whether it be mental illness, drug addiction or alcoholism, often in combination with a physical problem or chronic illness. The film does a good job in showing not only Nathaniel’s resistance to entering housing, but also his ultimate success. He does move in off the street. At a special showing of the film arranged by local agencies, Vivienne Stewart, Director of Housing at Greater Trenton Behavioral Health Care, commented that the same problems of homelessness shown in the movie exist in our own community. The magnitude of the problem on Skid Row in Los Angeles, she said, should not prevent us from seeing the very same issues faced by people who are homeless in Trenton. One of the programs under her supervision, Housing First, is providing very similar services to those provided in the film at LAMP, the residential center into which Nathaniel eventually moved. In Mercer County, Housing First tenants have moved and continue to move into their own apartments at scattered sites around the community. Executive Director of the Mercer Alliance, Herb Levine, recently interviewed the staff of Housing First, the program being implemented by Greater Trenton for the Mercer Housing First Collaborative, which is composed of city, county, state, United Way and other private funders. Six staff members participated in the interview, two supervisors and four case managers: Luis Colon, Myrene Maske, Andrea Raza, Marcus Smith, Vivienne Stewart and Tracy Wheeler. In the edited transcript that follows, their comments are given one at a time, but without attribution. Let’s start with the basic facts about Housing First. What are the requirements for entering the program? Housing First is for people who have been homeless for a year continuously or who have had four episodes of homelessness in three years. They have to be homeless when they come into the program – that means living in a shelter or some place not fit for human habitation – the street, an abandoned building, a car. They can’t be living with a friend or relative. They also have to have a disability that can be certified by a physician. The first tenants were housed in April, 2008, just over a year ago. How are they doing? They are stably housed and they are addressing their medical needs, such as vision care, diabetes and heart disease. Those medical issues could not be addressed at all when they were living in shelters or on the streets. How many people are now participating in Housing First in Mercer? We have 18 individuals and 10 families who are living in their own homes. About half live in Trenton and half in other communities. We interviewed well over 100 to get that many into housing. We will ultimately be able to give homes and services to 64. What would you say is especially rewarding about working in a Housing First program? This is a great program. It’s out of the blue! The clients think, this can’t be real. We’re housing people who haven’t had homes in years. The concept works. You house a person -- they have an address. They can feel good about having a place. They can begin to work on other things in their lives. I love watching them move in; I love getting all the furniture and décor for the apartment with them. We’re taking people from where they are. Think about G. He hasn’t had a home in 18 years. And what’s especially hard about working with this population? The bad thing is seeing people not follow through with housing. They get caught up in their addictions. I can’t help but think we let them down, even though I know that it can only happen when they’re ready. I saw K. yesterday [a client who stopped showing up before she was housed]. She feels guilty, fearful, ashamed. She looks at me and sees the opportunity she’s lost. Can you talk about some of the challenges for those who do move into housing? Well if you’ve had an apartment, you know about being a tenant and paying bills. But if you haven’t been in an apartment, you don’t know any of that stuff. For instance, G. recently went down to the electric company to pay a bill that hadn’t come yet. There was no way he could do that. Once people are housed, you’re working with them to get out of that homeless mindset. Some make the transition easily, for others it takes longer. But for everybody, it takes patience, building rapport and trust. What makes up the homeless mindset? They’ve been invisible when they were homeless. Homeless culture is faceless. They’ve been robbed of who they are. All the routines of having a house are very comforting. Mental illness, substance abuse, physical disabilities - all that can hold people back. What is the journey into recovery like? There’s a woman at the beginning of recovery who’s definitely making strides. She’s dealing with issues. She hasn’t relapsed. She’s not in jeopardy of losing her housing. All that is huge. There’s another woman who was on welfare who has gotten a job. Mercer’s Housing First program is different than most, because it includes both individuals and families. What’s it like working with the families? It’s a whole different dynamic. The children each have their own issues. There’s DYFS involvement. There are other agencies involved. The kids need their own treatment plans. The mothers don’t know how to model things for their children. Most of the women we work with – their mothers abandoned them for drugs. I have a client whose anxiety and stress level were so high when I met her. Now that she’s in her own apartment, her stress is so much lower; her relationship with her kids has improved. Services in Housing First are voluntary, not mandatory, as in other homeless housing programs. How does that work? When someone is told what to do, it puts that person in an adversarial stance. That’s often the way it was for them in housing programs where classes are mandated. But you can’t mandate learning. You can’t force people to learn before they are ready. If they don’t want to see us, they don’t have to, but because of the relationship we have, they want what we have to offer them. They will listen to competent people with good hearts. A caring heart will take people so much further than forcing them to sit in group. They haven’t been listened to – just listening to them makes such a huge difference. Case management is mirroring. They look at examples of what I do, and they see something different from what they’ve been used to seeing. How often do you see each tenant? At least once a week, but it could be all day, depending on what needs to get accomplished - whether it’s getting ID or going shopping or going to the doctor. Taking somebody to the Laundromat and helping to wash their clothes -- if they haven’t been able to do that for over a year, that’s huge. My favorite thing is seeing them cleaned up – getting their hair cut, their nails trimmed, wearing nice clothes. There was one man I hadn’t seen for a while - he got smaller. I realized he was no longer wearing four jackets. Thank you so much. You folks are awesome! The listening skills and the patience that are required to really get through to the homeless person are well-portrayed here. It takes an awful lot of time, time that people who work with the homeless seldom have because there are so many people to attend to. I remember my friend Adam, an alcoholic schizophrenic that I used to talk to. I eventually got him to dry out at a treatment center but I had to drive up to Morristown once a month to encourage him to continue. It’s a long term commitment. My heart goes out to all those homeless people who don’t have a saving grace like Nathaniel had. Average people who have just had a lot of bad breaks. The Soloist is a powerful movie that really brings home the fact that much as we try, we cannot and should not live another person’s life for them. Every human being deserves to live their own life. Unfortunately, many people with mental health issues wind up homeless and on the street. We can only be a friend and provide suggestions and support to a person who has a mental health illness. By providing stable housing to the mentally ill homeless without demanding or rejecting a person’s condition, society is in fact extending its hand of friendship and support. This is a movie that hits you hard emotionally. Having mental incapacities, Nathaniel still cared about the earth; he was interested in learning about Mr. Lopez’s life. Those examples show how caring he was. When Nathaniel was able to address Mr. Lopez as Steve, he knew he had a friend. What touched me the most was how Mr. Lopez responded to Nathaniel. At first, it was a story for the paper. But then Steve saw how kind-hearted and innocent Nathaniel was. Their relationship turned into so much more than just a story. Having someone place that much confidence and belief in another person makes the sky the limit. My heart broke watching all the struggles that Nathaniel had encountered in his life. I was also struck by how the desire to help and take action is not always the best approach. Building trust and a friendship over time allowed Nathaniel to move into a home. Not all of us have such an amazing talent like Nathaniel, but we all need love, understanding and a home. Housing First is an approach to ending long –term homelessness by offering rapid access to permanent housing and voluntary access to comprehensive services. The focus is on individuals and families who have continued to cycle through the shelter systems and been unsuccessful in programs requiring that they be drug and alcohol free or compliant with medication to access or maintain housing. The Housing First philosophy is that individuals and families are better able to benefit from and utilize supportive services when their housing has been stabilized. The Collaborative is committing about $1 million annually to the project, for three years. Other funders include: Tyco, Bristol Myers Squibb, Ortho McNeill Janssen Pharmaceutical Services & the Fund for New Jersey. The Mercer Alliance chairs the Collaborative, which funds and oversees the implementation of the demonstration project. What are the benefits of Housing First? ST is a 49 year old male who had been living in shelter for the last 4 years, since he and his wife separated. Since his housing with the HF program he has been working to get his driver’s license back in order to pursue his CDL. His plan is to go to work. FJ is a 42 year old male who was homeless for more than 3 years, staying in abandoned buildings, with friends, and in shelter. He works part-time and receives $500 per month. He grew up in a family in which substance abuse was the norm, and he began using at age 16. Prior to housing, he had been clean for 9 months and he continues to work on his recovery. RB is a 40 year female who had been homeless for over 5 years, staying at the emergency shelter, with friends, and in abandoned buildings. She has a mental illness as well as substance abuse and medical problems. KT is a 57 year old male who had been homeless for at least 4 years staying mostly in abandoned buildings. He receives Social Security. He had been injured at work, lost his job, and did not have any benefits for 2 years. He has severe chronic back pain. He now has a place where his family can visit him; his goal is to have better health. Ten families have been housed. 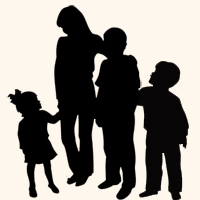 A number of families have a female head of household in her 20’s. They have about 3 children, most under the age of 7. They have had significant trauma in their lives including physical and sexual abuse and multiple foster care placements. They also experience depression and anxiety. They have had multiple episodes of homelessness, in family shelters and staying with friends and family.